Nizhniy Novgorod (Russia) (AFP) – Lionel Messi’s World Cup hopes hung by a thread on Thursday after Argentina were humbled 3-0 by Croatia on a dramatic day at the World Cup that saw the European side join France in the knockout rounds. Argentina knew they had to win in Nizhny Novgorod after their disappointing 1-1 opening draw against Iceland but instead collapsed in the second half to leave their campaign in tatters. A horrendous mistake by goalkeeper Willy Caballero and two further goals from Luka Modric and Ivan Rakitic mean the two-time former champions have to rely on an unlikely sequence of results if they are to progress in Russia. It was the heaviest defeat for the two-time world champions in the first round group stages of a World Cup tournament since they lost 6-1 to Czechoslovakia in 1958. 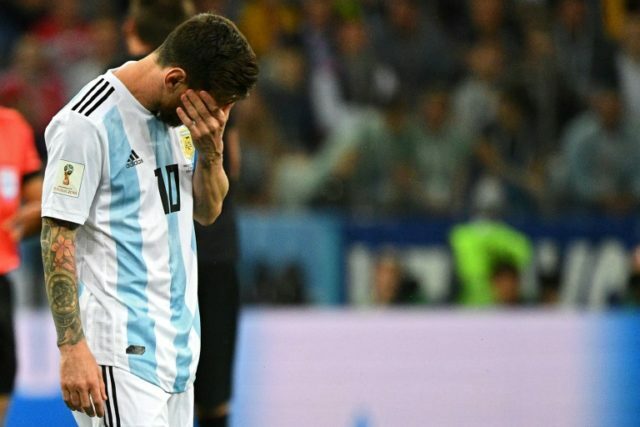 The result spelt another night of misery for Barcelona star Messi, who missed a penalty in Argentina’s opening match against Iceland. In stark contrast, his eternal rival Cristiano Ronaldo, who last month won his fifth Champions League winner’s medal, has already scored four goals in Russia and looks a shoo-in to win his sixth world player of the year award. Croatia sit at the top of Group D with six points. Iceland have one point, the same as Argentina, and Nigeria have no points, but both teams have a game in hand on the South Americans. It’s the first time that Croatia have progressed past the World Cup group stages since their third-placed debut in 1998. France, who won the tournament on home soil that year, earlier joined Russia and Uruguay in the last 16 with a 1-0 win against Peru, who cannot now progress from the group stage after two defeats. Paris Saint-German star Kylian Mbappe tapped into an empty net in the 34th minute in Yekaterinburg and the South Americans were unable to respond. Mbappe is now the youngest French goalscorer at a World Cup, aged 19 years and 183 days, beating David Trezeguet’s record of 20 years and 246 days. Denmark, also in France’s Group C, stayed on course for the knockout rounds after drawing 1-1 with Australia in the early game of the day in Samara. Christian Eriksen’s half-volley was cancelled out by Mile Jedinak’s VAR-assisted penalty after Yussuf Poulsen’s handball, giving Denmark four points, while Australia are stuck on one point. Australia coach Bert van Marwijk said the “last piece of the puzzle” — goals — was missing for his side who had several chances to win the game, leaving their survival hanging by a thread. “We had chances to win and we deserved to win, so I’m disappointed,” the Dutchman said. Russia have defied pre-tournament predictions that they would struggle by qualifying for the knockout round for the first time since the Soviet era. They will be joined by Uruguay, condemning Mohamed Salah’s Egypt and Saudi Arabia to an early exit from Group A.
Morocco will also be leaving Russia after the first round following their defeat by European champions Portugal, who are level with Spain on four points at the top of Group B. Former England captain David Beckham has tipped England to play Argentina in the World Cup final after a positive start against Tunisia. “I think obviously my choice would be England to win the competition, but that’s me being biased and passionate about my country,” Beckham said. And former FIFA president Sepp Blatter said he believes the World Cup should return to England when Europe next gets its turn to host the tournament.